Recently, I asked my sister if she knew about Kale, she instantly replied with "The New Godleaf". Well, I couldn't deny that, everybody seems to be eating Kale and surprisingly the trend has also caught up in India where people are cultivating it at home gardens. Indians take very well to bitter leaves and vegetables, so Kale is sure to please. Of many things I love about Kale, one is it's such a sturdy leaf. Unlike spinach, it doesn't wilt into a messy ugly green. Infact when flash cooked, it's shiner and glossier than raw. If you one of those people who like to tickle every taste bud, this salad is for you. The crunchy and spicy chickpeas are a nibbler's paradise. Kale provides body and a slight bitter edge to the salad. And the red chilli sprinkled mango? Cuts the spices with its sweetness, yet in a way enhances the whole salad. This salad keeps very well and is in fact better the next day, where the kale softens further with the acidity of lemon. The herb in the dressing is a must. You could choose between mint and basil, they both are equally delicious. Preheat the oven to 200 C. Mix all the ingredients except roasted cumin powder and bake for 35- 40 minutes, shaking the pan once or twice in between to ensure even cooking. At 35 minutes, remove the pan from the oven and toss in the kale and roasted cumin powder. Mix well, so the kale is lightly coated with the spices as well. Return to the oven and cook for another 5 minutes. Let it cool. Toss the mangoes will 1/2 tsp red chilly powder and add to above mix. Using a blender, blend all the ingredients. Toss the salad with the dressing. You will require only half the dressing. Scrumptious! This combo is perfect. Exactly the kind of food I love to eat. This salad looks so fabulous!! Love that dressing! I love kale. It's delicious and this is a great way of serving it. Love this, I've been eating a lot of kale daily and this is a fun new way to try this. What an interesting Salad. Like how you've roasted the garbanzo beans and the pictures are so good. Love the combo! It has all the elements and depth. Beautiful Kulsum! I have yet to try kale and I am really intrigued by its taste and texture. I am sure kale and mango would have paired well just as rocket and mango. Roasted chickpea addition is really cool and it must have given the salad a nice crunchy texture. Salads are favorite meal of mine... I too like to add mangoes to most of my summer salads mainly because of sweet taste combined with spiciness of crushed dried chillies tastes sooo good. I ate a similar Mango-Kale salad in a potluck a few months ago which turned out to be a light bulb kind of moment. Amazing combination! Through you thoughtful words you have painted a decadent picture in my mind. Gorgeous pictures Kulsum. Happy to see you back. 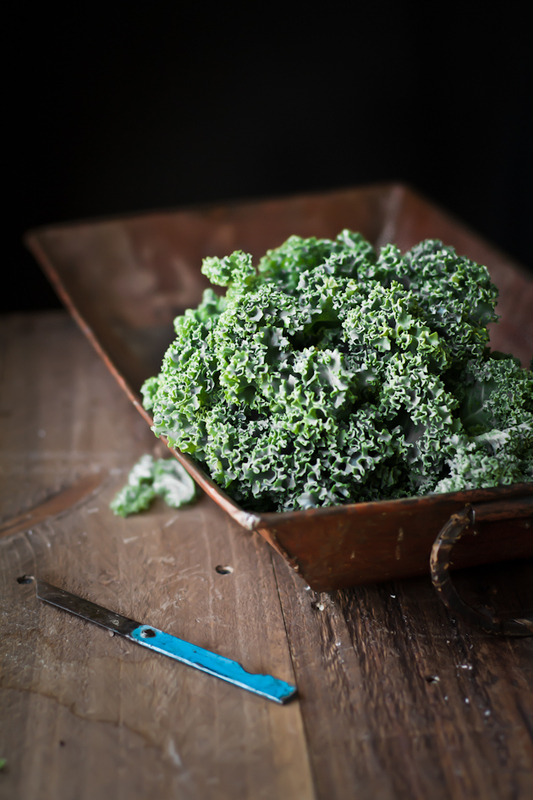 the only thing appealing to me about Kale is your picture. Unfortunately, I'm one of those people who tried Kale (in order to get on this bandwagon) and hated it! and I'm one of those people who will eat greens like candy! and I love bitter foods/vegetables but Kale didn't agree at all. I love everything else about this salad, think I could substitute Kale? Archana you sure could. Baby spinach or mix of greens would work really well. So delish! 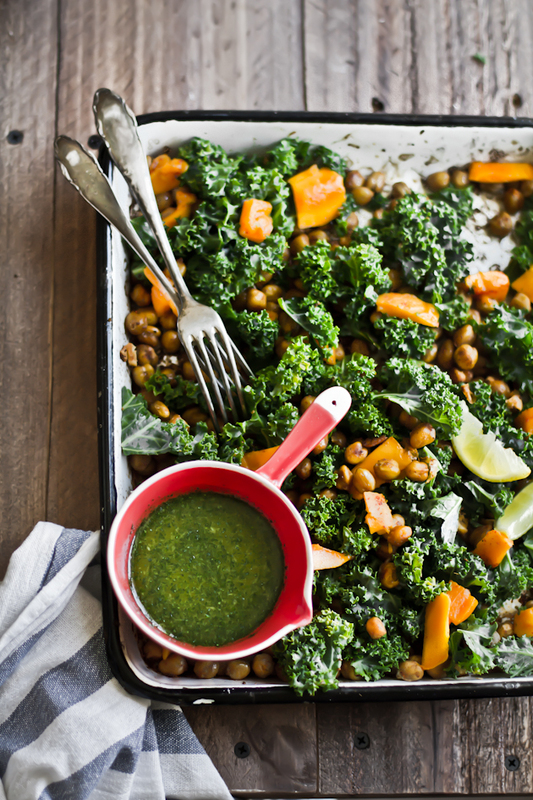 I love the flavors of kale and spices :) Pinned! Is this to be served warm or cold? Once the kale and chickpeas are out of oven, I let it cool and then add the mangoes. Thanks for bringing that up. Adding to the post. I am making this recipe right now...are the chickpeas supposed to be crunchy after you have roasted them?